A friend of mine used to talk about the fog in California. I visualized it as the fog I had experienced growing up in Arkansas. A bit here. A bit there. Always very localized. I thought that was what she was talking about. 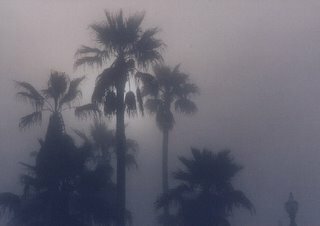 She said that sometimes the California fog lasted for days and that some people suffered depression because of it. California fog is like a blanket that covers the land and blacks out the light. It sometimes causes multi-car wrecks. Tonight, in the comfort of our neighborhood, we crept home in the fog. I turned on the wrong street because I couldn’t see our own street. The fog blocked the light, covered the signs, and created confusion. The fog made the light and warmth of our home comfortable and pleasant. I most hate the fog that fills the mind. Fog that comes from being tired, or unprepared, or indifferent. That fog only leaves when the light of truth shines on it.